Get insights on the aspects that you need to watch out for to assess your organization’s readiness to adopt HTML5 and tips to help you achieve better results as you convert Flash courses to HTML5. Get your hands on an essential toolkit that covers all aspects from the point you begin, pre-planning, and implementation. Know what you should watch out for and how the measures recommended here will help you in making a successful migration to HTML5. Get a comprehensive view of the HTML5 technology advantage, its challenges, and 8 tips that you can use when you plan the migration of your Flash courses to HTML5 that will help your business. You need to be aware of the learning design impact that Flash and HTML5 carry, understand the benefits and limitations of both, ascertain whether what you achieved with Flash is possible with HTML5 or not, account for the difference in the learner experience in specific frames and so on when you migrate your legacy/Flash/SWF content to HTML5. 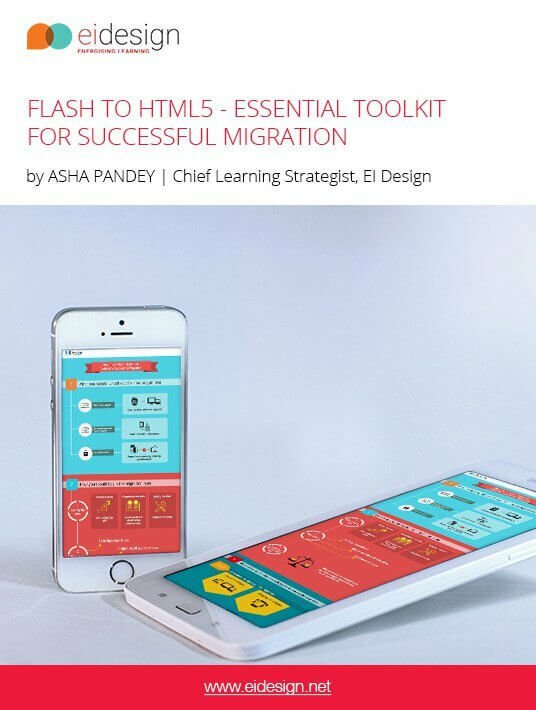 EI Design’s eBook contains top-notch advice on how to migrate from obsolete Flash to modern HTML5-based eLearning courses. Inside you will find industry-best practices as well as migration tips that will assist you with your business. Most of all, EI Design offers insights on what could go wrong during a migration from Flash to HTML5 and how to avoid losing money because of it.